More Please! … Please Stop! I can certainly do without that “F word”, but you get the idea of what petting is. We all love to pet our animals. It makes us feel good. It relaxes us, and it increases our mood. But what exactly is it doing to, or for, our animals? 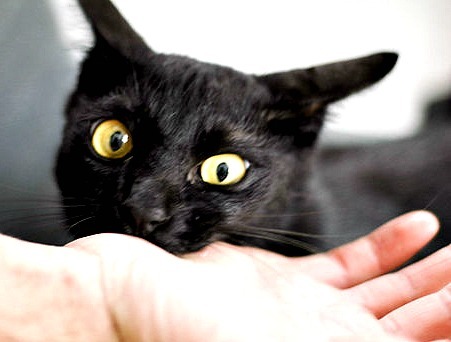 Anyone that has ever met a cat knows that felines can be particularly sensitive to petting. 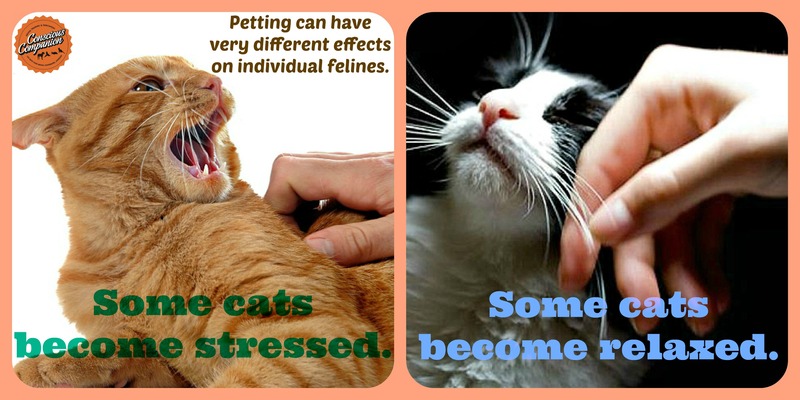 It matters to the cat who’s doing the petting, how they are petting, and for how long the petting lasts. If you are unsure when to stop petting, a cat will tell you when you are done, usually well before you are ready to stop petting him or her. CAT: You failed to notice that I wanted you to stop petting me, so this is how I tell you that you can stop petting me NOW. If you really think about it, humans (especially those of us who know what they like) are not that different from cats. I don’t like to be manhandled. I don’t enjoy being touched by strangers without being asked first. I like my personal space. If I don’t like the way someone is massaging my back or neck, you can bet that I will ask him or her to stop. Usually I don’t bite. Cats know what they like and don’t like, and they have no problem telling us. I adore them for that very reason. Last week there was a lot of discussion around this very subject. It centered around a study published recently in the journal “Physiology & Behavior” suggesting that petting cats in general can actually stress them out! The study was conducted by animal behavior experts from Brazil, Austria and Britain. They examined whether cats living in multi-cat households are more stressed than cats housed singly. The researchers found that cats release hormones linked to anxiety when handled by humans. Many media outlets responded to the study with an interpretation of the results and published articles titled “Cats Hate to be Stroked”. I was a bit surprised, believing this scientific article to be true, but I kept rolling it over and over in my head. I kept trying to correlate the article to all four of our cats, and it didn’t seem to add up. Only two of the four cats in our home have ever shown that they are stressed from being petted, and that was usually when “the “petter” was not aware that the cat was already wound tightly, or stressed from other stimuli in the home. The other two love to be petted 24/7, no matter what is happening in their environment. So what gives? To the relief of conscious cat guardians everywhere, who thought they would have to keep their hands off their felines, one of the study’s authors quickly issued a release retracting her conclusion. The co-author, Rupert Palme of the Institute of Medical Biochemistry at the University of Veterinary Medicine, Vienna, explains: “As a matter of fact, the majority of the cats enjoyed being stroked. Only those animals that did not actually like to be stroked, but nevertheless allowed it, were stressed.” She explained that the study had been misinterpreted and assured cat guardians that they “can carry on stroking their four-legged friends without worry.” Good to know. If you are a cat guardian, you probably already know those two facts. Every cat is unique, so we must interact with them as individuals. Each cat has preferences. Now, I must mention that petting a cat may seem like a fairly simple thing to do, but there is much more to it than you think. Jackson Galaxy, TV star and cat behaviorist, offers his tips on how to ensure that petting a cat will be enjoyable for everyone involved. You will see in the video below that there is no mindless full-body petting, and he is aware of where she enjoys to be touched. He also asks permission several ways. The dog may be wonderful prose, but only the cat is poetry.